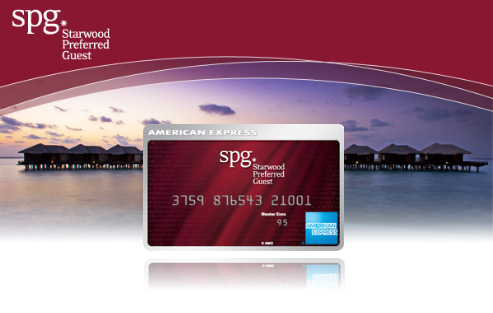 Update (6/3/14): The current offer has been increased to 30k points for the Amex SPG Personal and Amex SPG Business card. If you’d like to sign up using my referral code, please shoot me an e-mail and I’ll send you the sign-up link. Since I’ve got a European honeymoon coming up this summer, I’ve been in full force research mode – comparing prices and figuring out how to redeem all my credit card points for free travel. We only have a limited amount of time to honeymoon during July and that happens to coincide with the busiest time of the year(and the hottest) for European travel. It can be a lot harder to redeem points during peak travel season but it is doable as long as you start planning early. So far, I’ve been able to secure Economy MCE seats on AA to Rome, four nights in Rome(cash & points), 3 nights in Athens(cash & points), one suite night in Istanbul and a business flight on Air Canada from Istanbul to Los Angeles using my points. Not a bad start, but there’s a lot more work that has to be done if I want to get the whole trip paid for with points! When I’m looking for a new credit card, I generally won’t apply for a card unless it offers a bonus of 50,000 points or more. Starwood points are pretty unique though since they are ultra-flexible and they have some amazing redemption rates when you choose the points & cash option. I signed up for the AMEX SPG Business card a few months ago and just hit the spending bonus last month. That left me with 30,000 SPG points(25k from sign-up bonus and 5k from spending) to play around with. People are always asking me which card they should apply for and the answer is: it depends. A lot of cards out there offer great sign-up bonuses but the points are worthless if you don’t know how to use/redeem them. If you’re only looking to carry a couple cards it’s best to stay away from the program specific cards like the Amex Hilton or the Citi AA Visa. Instead you should opt for more broad based points systems like the Chase Ultimate Rewards Network or the Starwood Preferred Guest Network. These networks will allow you to transfer miles and/or redeem for airfare, hotels, cash, gift cards, etc. So What Can 30k Starwood Points Get You? The standard redemption rate for credit card bonuses is around 1 cent: 1 point, you should never redeem for anything less than that. Most of the time, gift cards and even cash back can be had at this conversion rate. But if you’re looking to maximize your points, spending them on airfare and/or hotels is usually the way to go. SPG has over 30 airline transfer partners(most are 1:1) and if you transfer 20,000 points to any of these airlines you’ll get a bonus of 5,000 points. This isn’t the best way to redeem your SPG points but if you’re very close to an award on AA for example, you could transfer in however many points you need at a 1:1 ratio. I wouldn’t transfer more than 20,000 points though since SPG points are most valuable when used on hotel stays. The best way to redeem SPG points for hotel-stays is through their cash and points option. Let’s look at a real life example for my stay in Athens at the end of July. I’m planning on spending 4 days/3 nights in Athens at the Grand Bretragne Hotel. 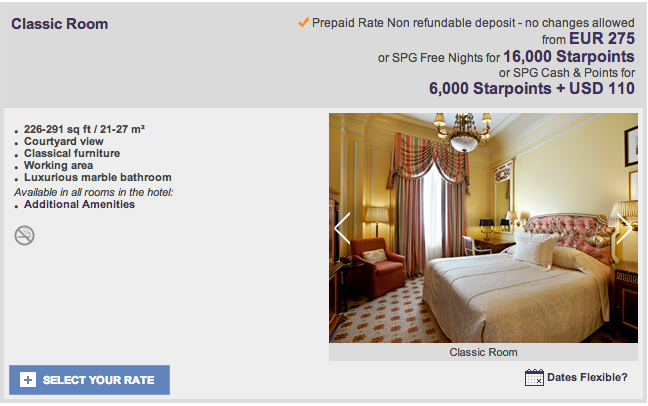 The nightly rate for a classic room is 275 Euros(or $376 as of 12/24/13) but that same exact room can be had for 6,000 Starwood points plus $110. So if I were to book the room without points, it would cost me $1,128 for 3 nights, yowza! But by using only 18,000 points and paying $330, I save $798! So my redemption rate is a whopping 4.43 cents per point! That’s over 4x a good or average redemption rate. And I still have 12,000 points left to use elsewhere. If I were to stay 6 nights in Athens, my savings would be around $1,600 and that’s all from one credit card sign-up bonus. Not to mention the fact that credit card bonuses are tax free! So even though 30,000 SPG points might not seem like a lot, in this case they’re worth about $1,600. Get 10,000 Starpoints® after your first purchase on the Card and an additional 15,000 Starpoints after you spend $5,000 in purchases on the Card within the first 6 months of Cardmembership. Spending $5,000 might not be doable for everyone so make sure that you don’t need to go outside of your normal spending habits in order to hit the sign-up bonus. Alternatively, if you’re willing to do a little manufactured spending, you could easily hit this spend requirement using Amazon Payments or by buying gift cards. Even though this is technically a business card, it’s very easy to qualify as a business owner. Instead of entering a business EID # on your application, you would enter your social security number. You don’t need to lie on your application to get approved but remember that businesses don’t necessarily have to make money. I’ve seen business cards approved for people who sell stuff on eBay, Craigslist, etc. Be creative but don’t lie since AMEX could ask to see your finances if they choose. If you’re not immediately approved for the card, make sure that you call the retention line within 24 hours and straighten things out. The retention line for AMEX is: (877) 399-3083 And here’s a good post on business card application strategy. If you’re interested in signing up for the Amex SPG Business or even the AMEX SPG Personal Card, shoot me an e-mail and I’ll send you a link to the sign-up offer. That way you’ll get the best offer available and I’ll get a 5k point referral bonus to help me pay for my honeymoon! Readers, what do you think about the Amex SPG business card and SPG points in general? Is it worth it to sign up for a card for $1,600 in rewards? I’d say YES but would love to hear your thoughts. I just got my SPG guest card approval today. Am I valid for the bonus offer? Offcourse after making first purchase? What do they mean by first purchase? Can the purchase be made on any category or just hotel bookings? The terms are: Get 10,000 Starpoints® after your first purchase on the Card and an additional 15,000 Starpoints after you spend $5,000 in purchases on the Card within the first 6 months of Cardmembership. The purchases can be anything and you should get the 10k and 15k respectively instantly once you complete the terms. As long as you signed up with a valid link, you should be good to go. I didn’t provide a sign up link in this article so I’m not sure which one you used. Stephen, that’s a great point. I forgot about that since I’ve only used it in the US so far. I was planning on bringing it for my honeymoon to pay for some Starwood hotels but I’ll probably be better served using my Barclay Arrival Card for the 2x points back and no foreign transaction fees (plus the cards are now chip and PIN!). I received the card and also got 10,000 points credited in my account. I suppose we get 15K points more if 5K is spent in 6 months. I’m trying to break my head how this spending limit could be achieved. Major portion every month I spend would be for rent ($900) but was told that 2.2 % charge would be incurred if paid via credit card. Put your normal spend on your card, that should be 500-$1,000 a month right? You could also buy gas gift cards to places like ARCO, or other gift cards to places you frequent a lot (grocery stores, food, etc). I think Amex is selling cash gift cards for no fee right now so you could buy a bunch of those and pay only shipping. More complex MS methods are things like Amazon Payments, Bluebird/Serve or Loyal3.